Newark Day Nursery’s Early Childhood Education curriculum is based on the Delaware Early Learning Foundations framework (ELFS) in conjunction with The Creative Curriculum, the Teaching Strategies Gold assessment tool (TSG), and the Ages and Stages Questionnaires (ASQ-3). These research based tools helps educators and families work together to improve our young children’s development in the areas of social emotional, physical, language, cognitive, literacy, and math skills. Family conferences for the ECE children are conducted at least twice per school year to set goals and review child’s growth. Teachers and/or the Program Director are available to discuss curriculum and /or children’s development. Our school age program utilizes lesson plans focused on experimenting with new interests, finding mentoring relationships and developing socialization opportunities. 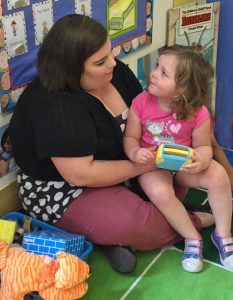 Our lead Early Childhood Education teachers have diverse experience-sets and education levels ranging from Child Development Associate National Credentials to Master’s degrees. We have a full-time Executive Director, full-time Program Director and a full-time School Age Services Coordinator, whose primary focuses are supporting our teachers to help maintain a high quality educational experience. All staff members regularly attend continuing education classes, and we value opportunities for teachers to grow professionally and share ideas. Teachers are supported with specialized training, resources, and the freedom to refine the learning environment to insure each child’s needs are met.